Neafie & Levy S. B. Co.
Frederica & Philadelphia Navigation Co., Wilmington, DE. Two 9 + 8 x 14", 220hp, 2 cylinder engines. 9' x 12", 125# steam. 1894 - 95 Lengthened 117.8 x 26 x 6.8', 315 gross / 282 net tons; sailed East Coast intercostal. 1930 Owned Erie Isles Ferry Co, Sandusky, OH. 1931 Rebuilt; renamed ERIE ISLE, owned Erie Isles Ferry Co, Put-in-Bay, OH; 5 daily trips from Old Fox's Dock - Catawba Co. Op. dock 1932 - 1942; capacity 13 cars & 300 passengers. 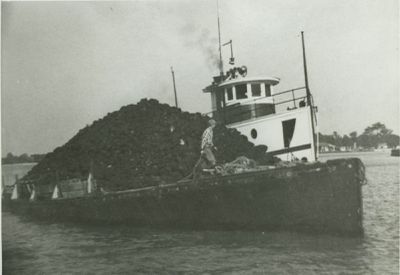 1942 Converted to barge for towing purposes to supply coal & sand to South Bass Island. 1946 Converted to barge, renamed FUBAR.